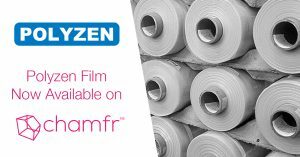 APEX, N.C. (April 9, 2019) — Polyzen announced today that it will offer its thermoplastic extruded films online through Chamfr Marketplace. Starting today, medical device engineers can go onto chamfr.com to order the company’s medical grade films – which are all in-stock and ready to ship within 24 hours. Medical grade thin films provide a versatile solution for medical device design engineers. These films can be used for a variety of applications such as bags, sheathes, barrier sleeves, balloons, bladders or more. Aside from extrusion, Polyzen can further support with the secondary operations of converting these films to product. Polyzen is a leading developer and manufacturer of engineered, polymer-based materials, films, components, and assemblies for the life-science industry. Polyzen’s range of material and processing technologies allow to provide optimum solutions for innovation-driven companies, ranging from entrepreneurial start-ups to major life-science OEMs. Chamfr is a new medical device focused multi-vendor marketplace where engineers and buyers can access hundreds of components for their medical device innovations. The one stop shop offers polyimide, thermoplastic, heat shrink and metal tubing, thin films, standard SS and PTFE coated mandrels, balloons and catheters, sutures, surgical needles and more. All components are in-stock and ready to ship in 24 hours. Learn more at Chamfr.com.